Who was the first human in space? The first person to go to outer space was the Russian cosmonaut Yuri Gagarin (1934–1968). He was attending the Industrial Technical School at Saratov, Russia, on the Volga River, when he joined a flying club and became an amateur pilot. At the recommendation of an instructor, Gagarin was accepted to the Orenbury Aviation School in 1955. 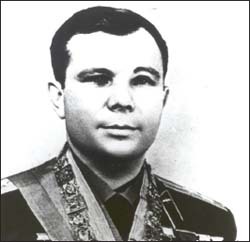 On November 7, 1957, Gagarin graduated with honors and was given the rank of lieutenant. He then went off to the Arctic to train as a fighter pilot. Inspired by the successful 1959 flight of the Soviet satellite Luna 3, which orbited the Moon, he applied to be among the first group of cosmonauts and was approved. For more than a year, he was involved in the testing and training for spaceflight. On April 12, 1961, Gagarin was launched in the Soviet spacecraft Vostok 1. His journey into space lasted 108 minutes, during which time Vostok 1 orbited Earth once and then returned. When his capsule was about two miles above the ground, Gagarin parachuted to safety and became a hero to the world. For the five years following his historic flight, Gagarin was kept busy with public appearances, political activities, administrative tasks, and training the next group of cosmonauts. In 1966 he began to prepare himself for another space mission, this time aboard a Soyuz spacecraft. The first Soyuz flight took place the following year; regrettably, the cosmonaut onboard, Vladimir Komarov (1927–1967), was killed during re-entry into Earth’s atmosphere. Gagarin continued to train, nonetheless, but never got the chance to go into space again. During a training flight on March 27, 1968, his aircraft spun out of control and crashed, killing him and his flight instructor.